On this we can agree: interim championships are an abomination. The worst. The “interim” tag itself is something close to a backhanded compliment. You’re almost the best. Almost. But not quite because, technicalities. In rare instances, the thing is a necessity. A champion is injured for a lengthy period, but not quite so long that they should be stripped of a prize they earned in blood. That pretty much ends the list. Technically, that is the prize that Dustin Poirier won at Saturday night’s UFC 236 for defeating the brilliant Max Holloway. Yet after a career paid for in strains and bruises, tears and breaks, Poirier deserves the full honorific as lightweight champion. No disrespect to undefeated current divisional kingpin Khabib Nurmagomedov, but when you launch yourself into a cageside brawl, and are suspended for your own silly actions, your regrettable decision is going to have consequences. And technically, Nurmagomedov remains UFC champion, because the promotion refuses to create any guidelines to govern such situations, but Poirier exemplifies all the best qualities of a champion. His journey to the top was an endless one, or something close. Twenty-two fights over eight years, in outposts both cosmopolitan and remote. From London and Las Vegas to Fairfax, Va. and Hidalgo, Texas, he was the epitome of a blue-collar worker grinding his way into the C-suite. When he first joined the UFC eight years ago, he was a 22-year-old kid with bright eyes and high hopes. All this time later, he’s a 30-year-old dad who’s experienced all the highs and lows this sport has to offer. He was in a 2012 Fight of the Year short-lister against Chan Sung Jung. He was humiliated by Conor McGregor, knocked out in less than two minutes. He suffered a terrible career setback when he lost to Michael Johnson in 2016. And those were just his losses. Somehow, Poirier survived the adversity and came out the other side with a white-hot fire. He told us repeatedly he would not be denied – that this was his destiny – but every UFC fighter says some version of that, right until the day the promotion tells them their services are no longer needed. Still, something along the line seemed to change Poirier in some way. He somehow began bending opponents with his will. 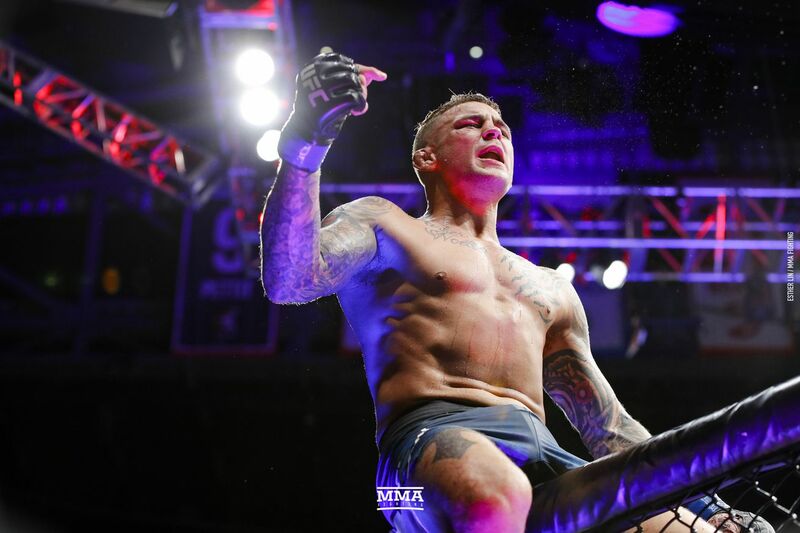 Starting with his UFC Norfolk win over Anthony Pettis in November 2017, Poirier broke through his personal glass ceiling with a series of stunning performances. He punished Pettis until the former champ could no longer continue. He wilted the resolute Justin Gaethje. He punished the sadistic Eddie Alvarez. Holloway though, was a different kind of challenge, the rare foe that could match and perhaps exceed both Poirier’s unshakable confidence and breakneck pace. To win, Poirier had to pull reserves from his deepest well. Every time Holloway seemed to get going, there was Poirier with a cracking straight left or thudding right hook. Whenever Holloway seemed to move the action near the fence where he likes it, Poirier fired off a combination and circled out. For every Holloway statement, there was an answer, and then some. There were no lulls in the action and precious few mistakes. There was absolutely no retreat. After all these years and all those battles, it was the very best Poirier. “I’m not going to take nothing away from Dustin,” Holloway said. “He beat a world champ, he is a world champ. There ain’t no interim, he’s the real thing. He beat a world champ.” Amen, Max. Leave it to a champion to recognize a champion. It seems cruel that Poirier will have to wait and hope that he is next up for Nurmagomedov, but that’s the way this game works as the promotion freestyles the fates of its fighters. The UFC has cards to book,and to be fair, there are other contenders waiting. Tony Ferguson has won 10 fights in a row, and as long as he sorts some personal issues out, is the top challenger in waiting. No. 2 contender Conor McGregor always looms in the distance. The division is like a deli counter. Pick a number and wait your turn. Whatever happens, no one can take away Saturday night from Poirier. His performance pulled from every part of his being. It was at times gutsy, sublime and soaring. He did not just win a fight; he outdueled one of the top gunslingers the sport has ever seen. “This is my belt,” he said after winning. “I earned this in blood, I paid in full. This is mine.” On this we can agree: he is right. His moment was more than a moment, it was the distillation of a career spent endlessly laboring in hot gyms, of seemingly dashed hopes resuscitated, of his life. The prize he won may not officially be the grandest prize in the sport, but it was captured by walking through fire. It was earned. So, let go of the “I” tag, it is no longer valid here. By all the measures that matter the most, Dustin Poirier is a champion.